The hotel is 10 km from Mahon and the airport and from the hotel to Cala'n Porter (the nearest beach) there are about 3 km. Ciudadela is situated about 50 km. 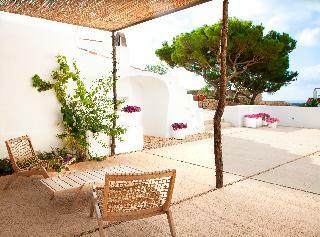 This historic Menorcan style estate has 70 hectares and consists of several restored houses. It has a restaurant and an outdoor terrace overlooking the gardens and sea. It offers concierge and reception service 24 hours, room service and laundry. Outdoor parking is free. There are also meeting and banquet spaces. 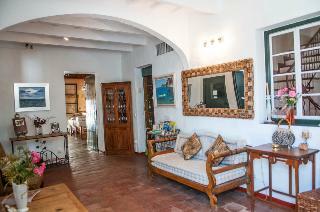 This country hotel enjoys a peaceful location, half way between San Luis and Es Castell. The centre of San Luis lies around 2 km away and the nearest beach is 5 km from the hotel. Mahón, the capital of this Balearic Island can be reached within a 10 minute drive. Housed in an old farmhouse from the 15th century, which has been carefully restored and renovated, this hotel is surrounded by 10,000 sqm of gardens. The comfortably furnished air-conditioned rooms feature a lounge, an en suite bathroom and other modern amenities needed for a comfortable stay. Guests will be able to dine under the stars at the on-site gourmet restaurant. They can choose dishes from an exquisite menu of freshly prepared foods using ingredients from the island and the hotel's own vegetable garden. 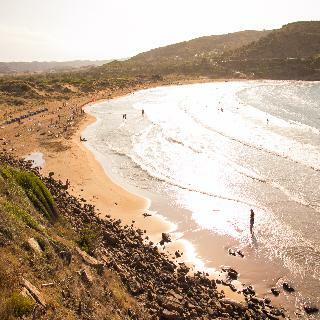 Carema Club Resort is located on the sea front with direct access to Cala Tirant beach, on the North coast of Menorca. All apartments have air conditioning, safe box (additional charge), bathroom, kitchen, free Wifi connection and TV. Superior apartments and Sea View Superior apartments have been redecorated in a medite-rranean style in 2015. Carema Club Resort is the perfect place for your family holidays with its on-site water park "Splash Park" and a full entertainment & all ages activities program, highlighting the main swimming pool, the restaurant buffet style "Vistamar" with its Kids zone, 2 "à la Carte" restaurants, a Kids Playground and sport tracks. Carema Garden Village apartments are on the sea front with a direct access to Cala Tirant, set in the GR223 Camí de Cavalls starting point: the ideal place to stay for nature and active tourism lovers. 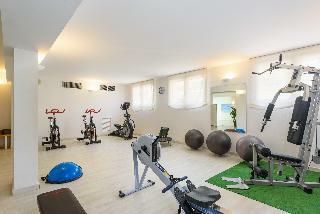 All apartments have been newly renovated in 2016. They offer basic studio apartments and apartments with one or two bedrooms, equipped with bathroom, TV, free Wifi connection, safe (additional charge), kitchenette and terrace or balcony. The cleaning crew comes to the apartment three times a week. The resort counts on 2 swimming pools and free public parking. Every Carema Garden Village customers can enjoy all Carema Club Resort facilities. Welcome to Hostal JumeSITUATED IN THE CENTER AND NEXT TO THE SPECTACULAR PORT OF MAHÓN.Its family atmosphere together with its practical and functional design, makes our guests feel at home. 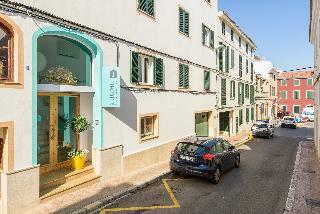 Hostal Jume is located in the historic and cultural center of Mahón. From here you have a stone's throw away the majestic and impressive Port of Mahon, one of the largest and most beautiful natural harbors of the Mediterranean and, why not say, of the world. Due to its privileged location, the hostel is ideal for travelers who seek friendly family service, central accommodation and, above all, tranquility.If you want to enjoy tranquility and, at the same time, visit the enchanting spots of this paradisiacal island, our hostel is the ideal starting point.If you are an active person and you like trekking or cycling, this is your ideal accommodation to explore the island by the "Camí de Cavalls" or through its roads and inland landscapes. We have a special corner for cyclists, secure parking, charging point for electric bikes, tools, main spare parts and routes from the Hostel.